If you have a blog, you produce a lot of content every year—valuable content that could be used for more than just blog posts. Indeed, with the right focus and planning, your blog can become a book-production machine. Many busy writers, authors and entrepreneurs don’t feel they have time to write a book, especially when they spend so much time on social media, marketing and promotion efforts—all so they can create a successful book. And blogging represents the cornerstone of that effort for most of them. Does that sound like you? If so, that means you write an enormous amount already because your have embraced social media and blogging in particular. You turn out a ton of content every week or month on your blog. And you may catch yourself thinking that with all that blogging, you don’t have time to write or finish your book. Booking a blog can be time consuming and overwhelming, though, especially if you have a lot of content to sift through. It’s not a smart or effective way to work. If you choose to do so, be sure to plan out the best book you can write, and then go looking for content that fits into that book. Then fill in any content gaps you might discover with new material. Don’t just grab a bunch of posts, slap them into a manuscript, and say, “I’ve written a book.” That won’t produce a good book. You can work smarter than these bloggers. (Sorry, Joel.) You can blog a book—consciously compose your book manuscript on your blog. Simply decide to write a blog post a day (or however many times a week you post to your blog) with the intention of composing a book in the process. But don’t just write any blog post. Write a blog post as one small part of the manuscript you are creating. If you already post consistently to your blog, you actually have enough time to write a book. The only thing you’ll need to do differently is approach your blogging as if you are writing a book, which requires some forethought and planning. You’ll soon discover that writing your book in post-sized bits feels easier and more manageable than tackling a book project on top of all your other work. This approach is easier for nonfiction writers, but novelists have tried it, too, with success. One thing to note—and this goes for booked blogs as well as blogged books: If you plan to use the KDP Select program, you can only publish 10 percent of your book online, otherwise Amazon will force you to take down the content. I suggest you simply use the KDP program instead. The plan for a blogged book that I describe in How to Blog a Book: Write, Publish, and Promote Your Work One Post at a Time, suggests leaving at least 20 percent of your book off the blog, which is why novelists and some memoirists have trouble with this approach. It also doesn’t meet the KDP Select criteria. So, how do you actually blog a book? Assuming you already have a blog, here are six steps to help you get your book blogged in no time. Choose a topic for your book. Whether or not you have been blogging prior to deciding to blog a book, determine the most marketable topic for your book or the subject that will best serve your readers, your brand or your business. When blogging a book you don’t jump aimlessly from topic to topic. You move in a focused manner from the beginning of your book to the end to get your book written. To do so you use a content plan. Evaluate your book’s marketability. You want it to be viable a viable business proposition—a book that you can turn into an ebook and sell. (Or maybe you want to give it away for free to attract readers to your mailing list or to attract leads.) If you book has a market, is unique, adds value, and supports your other products and services, it is a viable business proposition. Break each chapter down into post-sized bits. Write each chapter in 300-500 word pieces—blog posts. Break your content plan into small pieces by creating 15-20 subheadings (or posts) per chapter. If you have an idea of each chapter’s length, you can determine how many posts you’ll need to write to complete the chapter. Commit to a schedule. Decide how many days you will blog your book and stick to it. The more often you blog, the faster you will gain readers. You will also get your book written faster. It’s best to plan on writing at least 2-3 days per week. Produce a manuscript as you blog. Write your posts each day systematically in a word processing program (or Scrivener), and then copy and paste them into your blogging program. In this manner you produce an actual draft manuscript you can then edit and revise. Now comes the fun part. Once you know how to blog a book, you can blog long books and short books. The short books are your ticket to branding, expert status, customers and clients, and cash! Today, you can produce 4,000 to 20,000-word ebooks on Kindle, so do not think magnum opus! Just as you planned out the posts for a longer book, brainstorm a short book—a series of 10-30 posts. Once you’ve published these on your blog, repurpose them into an ebook or a print-on-demand book. I did this with my book, 10 Days and 10 Ways to Return to Your Best Self: A T’shuvah Tool Bridging Religious Traditions. I took 10 blog posts I’d written as a series, added an introduction and conclusion, edited the copy, and then tacked on some promotional material for my other short books at the end. When done, I had a 72-page book I printed on a short-run digital press and then at CreateSpace as well. I recently took a series of 12 posts I wrote, added additional posts of mine on the same topic, created a bit of new content for an intro and conclusion, and published an ebook called The Nonfiction Book Proposal Demystified: An Easy-Schmeasy Guide to Writing a Business Plan for Your Book. Within the next nine months, I’ll be releasing two more ebooks, both written as blog post series. Not long ago I saw an article about Frank Hecker, a blogger who wrote 23 posts on the topic of redistricting in Howard County, Maryland. Hecker then created an ebook on the topic, Dividing Howard: A History of County Council Redistricting in Howard County, Maryland. “Once I got to the point of seriously finishing I decided, ‘Hey, I want to turn it into an e-book.’” Hecker was quoted as saying in an article on ExploreHoward.com. Granted, he didn’t plan out the book in advance, but the e-book is the same as his 23-part blog series. The e-book puts all 23 posts together between two covers. Almost any blogger can create a book by repurposing 10 to 20 posts. Think about how easy it becomes to produce books from blogged content if you plan those posts as a series you know you will turn into a book—and how much better those books will be in the end. Take a look at your blog. Maybe you’ve already written a few series on your blog. Or maybe you’ve written a post you published two or three parts. You may be surprised to find you’ve already blogged a book. You could easily repurupose these into books. Here’s a post I wrote that will help you mine your blog for content and stimulate blog-series ideas to turn into books. And if you haven’t done so, simply plan out a short series, or a few series—or even a longer book. Then start blogging. Before you know it, you’ll have blogged a book or many books and your blog will have turned into a book-production machine. Thank you for your excellent post. We do something similar. I’d like to tell you what we do, then I have a question for you. I do editing and posting for Christian Fiction Author D.I. (David) Telbat. He is a prolific writer but I can only prep 2 full novels a year, besides posting twice a week. He provides free weekly short stories on his site that are usually in the same genre as his novels. And sometimes we serialize a novel that he’s already written, as we are doing right now. And that actually helps me to prep/edit another novel along the way (as you’ve referred to in your article), to slip in another eBook between novels. David has fans that can’t get enough of his writing so this keeps them happier between his longer works. We’ve serialized several novels this way (some shorter, some longer). Each week, I put the chapter links on a page for anyone that has come into the story midstream so they can read past chapters whenever they choose. When we’ve finished serializing, I take down the links, create an eBook, David adds a prologue and/or a couple new chapters, and we publish through KDP and Smashwords. It hasn’t hurt sales at all. Many of his fans desire to have the completed eBooks in their libraries and to reread them. My question for you: after I’ve taken down the links to the past chapters and created an eBook, should I completely delete the past serialized chapters so they are no longer in our archives? Removing them would break internal links but it would clean up having so many posts. What do you do or recommend for us? Thank you for your time and direction for us. I think what you are doing is great! How long are the posts? I wouldn’t remove any of the posts, especially since the books contain additional chapters or a prologue. And since you aren’t using KDP Select, you can have the material online. More posts is better. The more posts you have, the more there is for Google to catalog. Generally, the more posts you have the more traffic you get. Someone once told me that once you hit 1000 posts, traffic spikes. So, more is good! I can see taking down the posts to entice readers to the book, however, but it is a big clean-up job. I never took down the posts from How to Blog a Book, or any of the series I produce as ebooks–for what it’s worth. I’d love to have a guest post about what David has done and his success. Might he be interested in writing one for me to post at http://www.howtoblogabook.com? Thanks for your quick reply, Nina! And thank you for your direction. That sounds good. I won’t bother trying to delete and cleanup all those posts and broken links. As for length, we originally tried short posts (400-500 words), but for fiction, that just didn’t satisfy David’s readers. So now we post between 1000-1500 words. That seems to work well, though I’ve even gone as long as 2000 words occasionally. If his chapters happen to be extra short, I double them up that week. Like today, I just posted three short chaps in his current serialized novel. I’ll be in touch through your website. Thank you again for your input and great post! I think I might try this. Not sure for what yet, though. I guess I’m a little apprehensive about putting my novel online. But I could see myself doing a separate, stand alone fiction work, that I can give away later. Nina: Could you elaborate or point us to an example of how a novelist would do this? It seems like if a fiction writer releases parts of the story as it’s written, then you lose the ability to do major edits. Fixing a plot hole, for instance. If a fiction writer finishes an entire story before releasing it in sections on the blog, I can see that happening, but then you’d have to consider whether that’s a preferable alternative to simply making the book right off the bat. This is a much more difficult process for novelists. You can go back and edit your posts, of course. That’s no problem, but you will have released the first version as that first draft. Remember, the readers will be true readers (not some critique group who possibly has no real interest in your story or experience in your genre). So they can also give you great feedback on that first draft. Then you go off and make edits and revisions. You later release your final in printed or ebook form, and that gives the blog readers reason to purchase it. Does that make sense? They are invested in it–they helped you perfect the story. They also want to see how it changed from the blogged version. Very useful information. I recently launched my blog and now I’m working on a content strategy. Your article adds another dimension to it. To develop an author’s platform I started my blog — to establish an online social presence for my first book which I’m currently working on. However, the blog’s content is for my second book, and your article helped me clarify it and gives me a strategy to follow right from the start. Thank you, Nina, for sharing such valuable content! You are very welcom, Pat! Let me know how it goes. I’m always looking for bogged book success stories to publish at http://www.howtoblogabook.com. I love the tip about copying and pasting the blog posts from a word program. What a time saver! Thanks for the tip. Yes…I have tried numerous ways to get blog content into Word. None of them are easy or cheap. Just start with Word! Nina, could you explain this one step further? I’ve seen authors post their chapters online on their blogs. My concern is that once you’ve done that, isn’t it considered “published”? I’ve seen comments from traditional and indie publishers and literary agents who decline to consider a book if it’s been posted on a blog (not just an excerpt). They claim the work must be “unpublished.” What about that? If an author does this chapter by chapter book blogging, is he or she sabotaging their work for future publication? And what about the readers? If they are reading the story continuously online, does that hurt book sales once it’s self-published? The copyright office does not consider it published work. Agents and publishers do. That said, for nonfiction, it doesn’t seem to matter–if you have produced a successful test marketing experiment. 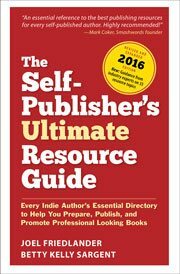 By that I mean that as you blogged your book you have built an author platform–a built-in readership for the book. If you have accumulated subscribers to the blog and to your mailing list, built your social networks, etc., an agent or publisher will jump at the book. That’s why there continue to be so many blog-to-book deals made. Now, for fiction, this is a different story. I suggest blogging a first novel, building a platform (readership for the book), and successfully self-publishing. If you do that, you will have an easier time selling the second novel. Most fiction publishers will, indeed, see this as previously published work and not want it. They may come back and publish it later after publishing your newer books successfully, though. See it like building a track record and, of course, a platform. Remember that I’m not talking about publishing whole chapters. I’m talking about publishing chapters in post-sized bits. Publishing whole chapters is called serialization. That will not build you a platform in the way I’m explaining above. It works in the other direction, too. Blog posts can become books and parts of books can become blog posts. Also, a post from one blog can be used on other blogs and websites and in magazine articles. You can sell the same word more than once! Recycle, rearrange, repurpose, reuse, resell. Booking a blog is a good strategy, but much harder, and most bloggers just slap some posts together with no thought or revision. That’s not a good book. They need a plan for a good book. Then you go to the blog and look for the content and fill in gaps with new content. As for the other uses…all good suggestions.